The C-post of AJ Allmendinger's car is carrying a special decal this weekend at Martinsville Speedway. AJ Allmendinger and the entire No. 47 JTG Daugherty Racing team are competing with heavy hearts this weekend at Martinsville Speedway following the death of the team’s front-end mechanic, Mark Bieberich, who passed away on Wednesday. Bieberich, 45, lived in Harrisburg, North Carolina, and leaves behind a wife and four children. Bieberich moved from Spencer, New York, to the Charlotte, North Carolina, area almost 20 years ago to begin his career in NASCAR where he worked as a mechanic and car chief with numerous teams. "Mark was just a great guy," Allmendinger said at Martinsville Speedway in audio provided to FOXSports.com by the driver’s public relations representative. "He was a quiet guy. I actually didn’t even have a lot of interaction with him because he was just a quiet guy that did his job, went to work and made sure he did his job right and kind of went home, but at the shop he was always just a great guy to be around, just to talk to." 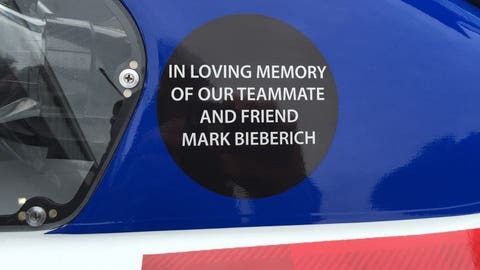 As a tribute to the man known to some as "Biebs," Allmendinger is carrying a special decal on his car’s C-post all weekend at Martinsville. "He really cared about the race team and us as a family when it comes to the race team, so we have heavy hearts and it’s something that hopefully we can take and make him proud, and it’ll inspire us to go out there and have a chance to win on Sunday," Allmendinger said.